I know I was absent this week here on my blog. It was a super duper busy week. happy to say it's over and I'm off today. Do you remember what tomorrow is? Yep Paper Trey Ink releases their newest stamps. Of course I had to play with last months releases (finally) and make some holiday tags. I really want to do more handmade this year. Mom and I already decided instead of buying ornaments for our annual ornament exchange we are making them for each other this year. I already have a couple ideas I want to try out. Here's today's Stampin' On Friday video. Christina, That tag is gorgeous!! !I think you should be on Papertrey Ink's design team also. Wow you make me want everything you use of their's. If that doesn't inspire people to make tags I don't know what would. I love this! I think it is my favorite video that I have seen in a while. I love everything that you do but this is my favorite!!! I LOVE this!! I love it so much that I think I'm going to have to get those stamps and dies!! This is right down my alley, design-wise. Thanks so much for sharing this. This tab is gorgeous! I could see incorporating these same ideas on a scrapbook LO and/or a card. This is just beautiful. I too am excited about the new releases. I don't have the set you used today, I think that may have to be next! Thanks for the wonderful ideas and your inspiration. Gorgeous! I love the angel stamp. Thanks for listing all of the products too. Oh Christina, that video is worth watching more than once. I love love that angel tag. I never miss once of your videos. Thank you for sharing your talent. You did it again! I had no desire to make tags until I saw what you made. The more I look at your tag the more I need the dies and have to make some for my own packages. Thank you for being so willing to share your talent. well my post is gone... Love all oyur video's great tag idea... thanks for sharing as always. Such a beautiful tag. Running over to PTI to buy the die. I'm so needing that tag die!! Thanks, Christina. Christine Love your tag!! I have to go an get what I need to make some for my gifts!! I do have a question I love your Frog holder can you tell me where you got it? So pretty! I love that angel, she is so sweet. Really pretty tag, not seen this die before. 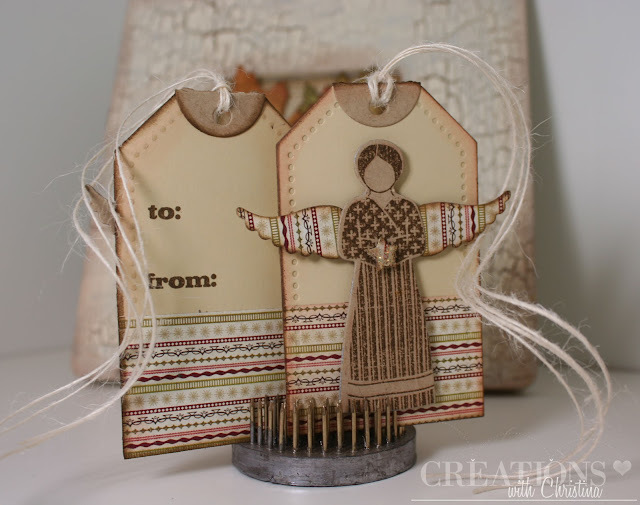 Love the angel and the papers used.